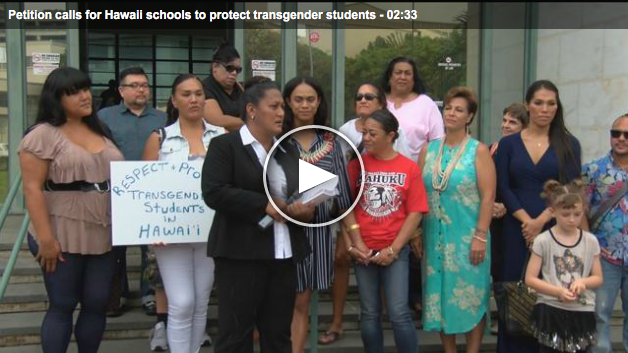 Transgender leaders are calling on Hawaii public schools to develop guidelines and training to protect transgender students from discrimination. Advocates with the Kumu Hina Project hand-delivered a petition Tuesday with more than 5,400 signatures to Board of Education members. "It's about fairness, equity, and a sense of dignity for all of our students, transgender or not," said Hina Wong-Kalu, a teacher and cultural practitioner. Advocates want the state to create guidelines to promote respect and stop discrimination across the gender spectrum. "It's the feeling of inadequacy, it is the feeling of being less than, and it is the feeling of being unappreciated," said Wong-Kalu. Transgender students in Hawaii's public schools are currently handled on a case-by-case basis. "I think for any community that has been waiting for something like this, it could not be soon enough, so I understand their concerns," said Donalyn Dela Cruz, state Department of Education spokeswoman. Dela Cruz said anti-discrimination policies already in place cover transgender students. For the last seven months, officials have also been working on draft guidelines which are now under review by the Attorney General's office. "It's not just about bathroom situations, it's not just about athletics, but it's looking at how are we going to establish student identification records," Dela Cruz explained. The DOE took a look at best practices from other states and relied on input from principals and various stakeholders. "There's a need for it. We've been working on it, and at the end of the day, we want to make sure that when the next school year comes, that our schools have this guidance," said Dela Cruz. Once the attorney general approves the guidelines, the DOE will notify BOE members and send the information out to schools.